Bruns, C. J.; Stoddart, J. F. The Nature of the Mechanical Bond. Hoboken: John Wiley & Sons, 2016. 761 pp. 2. Bruns, C. J.; Stoddart, J. F. Mechanically Interlaced and Interlocked Donor-Acceptor Foldamers. Adv. Polym. Sci. 2013, 261, 271–294. 1. Bruns, C. J.; Stoddart, J. F. The Mechanical Bond: A Work of Art. Top. Curr. Chem. 2012, 323, 19–72. 26. Slack, C. C.; Finbloom, J. A.; Jeong, K. Bruns, C. J.; Wemmer, D. A; Pines, A.; Francis, M. B. Rotaxane Probes for Protease Detection by 129Xe HyperCEST NMR.Chem. Commun. 2017, 53, 1076–1079. 25. Bruns, C. J.; Liu, H.; Francis, M. B. Near-Quantitative Aqueous Synthesis of Rotaxanes via Bioconjugation to Oligopeptides and Proteins. J. Am. Chem. Soc. 2016, 138, 15307–15310. 24. Finbloom, J. A.; Slack, C. C.; Bruns, C. J.; Jeong, K.; Wemmer, D. E.; Pines, A.; Francis, M. B. Rotaxane-Mediated Suppression and Actvation of Cucurbituril for Molecular Detection by 129Xe HyperCEST NMR. Chem. Commun. 2016, 52, 3119–3122. 23. Aytun, T.; Santos, P. J.; Bruns, C. J.; Huang, D.; Koltonow, A. R.; Olvera de la Cruz, M.; Stupp, S. I. Self-Assembling Tripodal Small-Molecule Donors for Bulk Heterojunction Solar Cells. J. Phys. Chem. C 2016, 120, 3602–3611. 22. Hou, X.; Ke, C.; Bruns, C. J.; McGonigal, P. R.; Pettman, R. B.; Stoddart, J. F. Tunable Solid-State Fluorescent Materials for Supramolecular Encryption. Nature Commun. 2015, 6:6884. 21. Bruns, C. J.; Fujita, D.; Hoshino, M.; Sato, S.; Stoddart, J. F.; Fujita, M. Emergent Ion-Gated Binding of Cationic Host-Guest Complexes Within Cationic M12L24 Molecular Flasks. J. Am. Chem. Soc. 2014, 136, 12027–12034. 20. Bruns, C. J.; Stoddart, J. F. Rotaxane-Based Molecular Muscles. Acc. Chem. Res. 2014, 47, 2186–2199. 18. Bruns, C. J.; Li, J.; Frasconi, M.; Schneebeli, S. T.; Iehl, J.; Jacquot de Rouville, H.-P.; Stupp, S. I.; Voth, G. A.; Stoddart, J. F. An Electrochemically and Thermally Switchable Donor-Acceptor [c2]Daisy Chain Rotaxane. Angew. Chem., Int. Ed. 2014, 53, 1953–1958. 17. Bruns, C. J.; Herman, D. J.; Minuzzo, J. B.; Lehrman, J. A.; Stupp, S. I. Rationalizing Molecular Design in the Electrodeposition of Anisotropic Lamellar Nanostructures. Chem. Mater. 2013, 25, 4330–4339. 16. Fahrenbach, A. C.; Bruns, C. J.; Li, H.; Trabolsi, A.; Coskun, A.; Stoddart, J. F. Ground-State Kinetics of Bistable Redox-Active Donor-Acceptor Mechanically Interlocked Molecules. Acc. Chem. Res. 2014, 47, 482–493. 15. Ruiz-Carretero, A.; Aytun, T.; Bruns, C. J.; Newcomb, C. J.; Tsai, W.-W.; Stupp, S. I. Stepwise Self-Assembly to Improve Solar Cell Morphology. J. Mat. Chem. A 2013, 1, 11674–11681. 14. Guerrero, A.; Loser, S. C.; Garcia-Belmonte, G.; Bruns, C. J.; Smith, J.; Miyauchi, H.; Stupp, S. I.; Marks, T. J.; Bisquert, J. Solution-Processed Small Molecule:Fullerene Bulk-Heterojunction Solar Cells: Impedance Spectroscopy Deduced Bulk and Interfacial Limits to Fill-Factor. Phys. Chem. Chem. Phys. 2013, 15, 16456–16462. 13. Juriček, M.*; Barnes, J. C.*; Dale, E. J.; Liu, W.-G.; Strutt, N. L.; Bruns, C. J.; Vermeulen, N. A.; Ghooray, K.; Sarjeant, A. A.; Stern, C. L.; Botros, Y. Y.; Goddard, W. A. III; Stoddart, J. F. Ex2Box: Interdependent Modes of Binding in a Two-Nanometer-Long Synthetic Receptor. J. Am. Chem. Soc. 2013, 135, 12736–12746. 12. Bruns, C. J.; Stoddart, J. F. Molecular Machines Muscle Up. Nature Nanotechnol. 2013, 8, 9–10. 11. Zhu, Z.; Bruns, C. J.; Li, H.; Lei, J.; Ke, C.; Liu, Z.; Shafaie, S.; Colquhoun, H. M.; Stoddart, J. F. Synthesis and Solution-State Dynamics of Donor-Acceptor Oligorotaxane Foldamers. Chem. Sci. 2013, 4, 1470–1483. 10. Barnes, J. C.*; Juriček, M.*; Strutt, N. L.; Frasconi, M.; Sampath, S.; Giesener, M. A.; McGrier, P. L.; Bruns, C. J.; Stern, C. L.; Sarjeant, A. A.; Stoddart, J. F. ExBox: A Polycyclic Aromatic Hydrocarbon Scavenger. J. Am. Chem. Soc. 2013, 135, 183–192. 9. Gothard, C. M.*; Bruns, C. J. *; Gothard, N. A.; Grzybowski, B. A.; Stoddart, J. F. Modular Synthesis of Bipyridinium Oligomers and Corresponding Donor-Acceptor Oligorotaxanes with Crown Ethers. Org. Lett. 2012, 14, 5066–5069. 8. Jacquot de Rouville, H.-P.; Iehl, J.; Bruns, C. J.; McGrier, P. L.; Frasconi, M.; Sarjeant, A. A.; Stoddart, J. F. A Neutral Naphthalene Diimide Rotaxane. Org. Lett. 2012, 14, 5188–5191. 7. Basuray, A. N.; Jacquot de Rouville, H.-P.; Hartlieb, K. J.; Kikuchi, T.; Strutt, N. L.; Bruns, C. J.; Ambrogio, M. W.; Avestro, A.-J. ; Schneebeli, S. T.; Fahrenbach, A. C.; Stoddart, J. F. The Chameleonic Nature of Diazopyrenium Recognition Processes. Angew. Chem., Int. Ed. 2012, 51, 11872–11879. 6. Fahrenbach, A. C.; Hartlieb, K. J.; Sue, C.-H.; Bruns, C. J.; Barin, G.; Basu, S.; Olson, M. A.; Botros, Y. Y.; Bagabas, A.; Khdary, N.; Stoddart, J. F. Rapid Thermally Assisted donor-acceptor catenation. Chem. Commun. 2012, 48, 9141–9143. 5. Fahrenbach, A. C.; Bruns, C. J.; Cao, D.; Stoddart, J. F. Ground-State Thermodynamics of Redox-Active Donor-Acceptor Mechanically Interlocked Molecules. Acc. Chem. Res. 2012, 45, 1581–1592. 4. Loser, S.; Bruns, C. J.; Miyauchi, H.; Ponce Ortiz, R.; Facchetti, A.; Stupp, S. I.; Marks, T. J. A Naphthodithiophene-Diketopyrrolopyrrole Donor Molecule for Efficient Solution-Processed Solar Cells. J. Am. Chem. Soc. 2011, 133, 8142–8145. 3. Bruns, C. J.; Basu, S.; Stoddart, J. F. Improved Synthesis of 1,5-DinaphthoCrown-10. Tetrahedron Lett. 2010, 51, 983–986. 1. Boonya-Udtayan, S.; Yotapan, N.; Woo, C.; Bruns, C. J.; Ruchirawat, S.; Thasana, N. Synthesis and Biological Activities of Azalamellarins. Chem. Asian J. 2010, 5, 2113–2123. 29. Sluysmans, D.; Devaux, F.; Bruns, C. J.; Stoddart, J. F.; Duwez, A.-S. Dynamic Force Spectroscopy of Synthetic Oligorotaxane Foldamers. Proc. Natl. Acad. Sci. U.S.A. 2018, 115, 9362–9366. Wholly synthetic molecules involving both mechanical bonds and a folded secondary structure are one of the most promising architectures for the design of functional molecular machines with unprecedented properties. Here, we report dynamic single-molecule force spectroscopy experiments that explore the energetic details of donor–acceptor oligorotaxane foldamers, a class of molecular switches. The mechanical breaking of the donor–acceptor interactions responsible for the folded structure shows a high constant rupture force over a broad range of loading rates, covering three orders of magnitude. In comparison with dynamic force spectroscopy performed during the past 20 y on various (bio)molecules, the near-equilibrium regime of oligorotaxanes persists at much higher loading rates, at which biomolecules have reached their kinetic regime, illustrating the very fast dynamics and remarkable rebinding capabilities of the intramolecular donor–acceptor interactions. We focused on one single interaction at a time and probed the stochastic rupture and rebinding paths. Using the Crooks fluctuation theorem, we measured the mechanical work produced during the breaking and rebinding to determine a free-energy difference, ΔG, of 6 kcal·mol−1 between the two local conformations around a single bond. 28. Sluysmans, D.; Hubert, S.; Bruns, C. J.; Zhu, Z.; Stoddart, J. F.; Duwez, A.-S. Synthetic Oligorotaxanes Exert High Forces When Folding Under Mechanical Load. Nature Nanotech. 2018, 13, 209–213. Folding is a ubiquitous process that nature uses to control the conformations of its molecular machines, allowing them to perform chemical and mechanical tasks. Over the years, chemists have synthesized foldamers that adopt well-defined and stable folded architectures, mimicking the control expressed by natural systems. 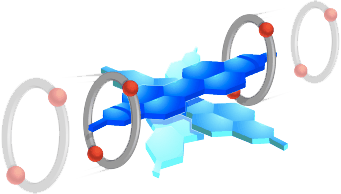 Mechanically interlocked molecules, such as rotaxanes and catenanes, are prototypical molecular machines that enable the controlled movement and positioning of their component parts. Recently, combining the exquisite complexity of these two classes of molecules, donor–acceptor oligorotaxane foldamers have been synthesized, in which interactions between the mechanically interlocked component parts dictate the single-molecule assembly into a folded secondary structure. Here we report on the mechanochemical properties of these molecules. We use atomic force microscopy-based single-molecule force spectroscopy to mechanically unfold oligorotaxanes, made of oligomeric dumbbells incorporating 1,5-dioxynaphthalene units encircled by cyclobis(paraquat-p-phenylene) rings. Real-time capture of fluctuations between unfolded and folded states reveals that the molecules exert forces of up to 50 pN against a mechanical load of up to 150 pN, and displays transition times of less than 10 μs. While the folding is at least as fast as that observed in proteins, it is remarkably more robust, thanks to the mechanically interlocked structure. Our results show that synthetic oligorotaxanes have the potential to exceed the performance of natural folding proteins. 27. Loser, S.; Lou, S. J.; Savoie, B. M.; Bruns, C. J.; Timalsina, A.; Leonardi, M. J.; Harschneck, T.; Turrisi, R.; Zhou, N.; Stern, C. L.; Sarjeant, A. A.; Facchetti, A.; Chang, R. P. H.; Stupp, S. I.; Ratner, M. A.; Chen, L. X.; Marks, T. J. Systematic Evaluation of Structure-Property Relationships in Heteroacene-Diketopyrrolopyrrole Molecular Donors for Organic Solar Cells. J. Mater. Chem. A 2017, 5, 9217–9232. Improved understanding of fundamental structure–property relationships, particularly the effects of molecular shape and intermolecular packing on film morphology and active layer charge transport characteristics, enables more rational synthesis of new p-type small molecules. Here we investigate a series of small molecules consisting of an acene-based electron-rich core flanked by one or two electron-deficient diketopyrrolopyrrole (DPP) moieties. Through minor changes in the molecule structures, measurable variations in the crystal structure and sizable differences in macroscopic properties are achieved. The molecular symmetry as well as the conformation of the side chains affects the unit cell packing density and strength of the intermolecular electronic coupling in single crystals of all molecules in this series. The addition of a second DPP unit to the benzodithiophene (BDT) core increases molecular planarity leading to decreased reorganization energy, strong cofacial coupling, and moderate hole mobility (2.7 × 10−4 cm2 V−1 s−1). Increasing the length of the acene core from benzodithiophene to naphthodithiophene (NDT) results in a further reduction in reorganization energy and formation of smaller crystalline domains (∼11 nm) when mixed with PCBM. Decreasing the aspect ratio of the core using a “zig-zag” naphthodithiophene (zNDT) isomer results in the highest hole mobility of 1.3 × 10−3 cm2V−1 s−1 due in part to tight lamellar (d = 13.5 Å) and π–π stacking (d = 3.9 Å). The hole mobility is directly correlated with the short-circuit current (11.7 mA cm−2) and solar cell efficiency (4.4%) of the highest performing zNDT:PCBM device. For each of these small molecules the calculated π-coupling constant is correlated with the hole mobility as a function of crystal structure and orientation indicating the importance of designing molecules that create extended crystalline networks with maximal π-orbital overlap. We report a CB6 rotaxane for the 129Xe hyperCEST NMR detection of matrix metalloprotease 2 (MMP-2) activity. MMP-2 is overexpressed in cancer tissue, and hence is a cancer marker. A peptide containing an MMP-2 recognition sequence was incorporated into the rotaxane, synthesized via CB6-promoted click chemistry. Upon cleavage of the rotaxane by MMP-2, CB6 became accessible for 129Xe@CB6 interactions, leading to protease-responsive hyperCEST activation. Abstract: In spite of widespread interest in rotaxane-based molecular machines and materials, rotaxanes have not been attached covalently to proteins. We describe the near-quantitative aqueous synthesis of rotaxanes based on neutral and charged aqueous hosts—cucurbituril (CB7) and cyclobis(paraquat-p-phenylene) (CBPQT4+), respectively—using the thiol-ene addition of cysteine and maleimide as a stoppering protocol. After verifying the high efficiency of the reaction using glutathione (GSH) as an oligopeptide stopper, we have employed cytochrome C (CytC) as a protein stopper to produce the first well-characterized protein–rotaxane bioconjugates. We anticipate that this methodology will enable the preparation of novel materials that combine the unique properties of proteins and mechanical bonds. Abstract: We report a method for blocking interactions between 129Xe and cucurbituril (CB6) until activation by a specific chemical event. We synthesized a CB6–rotaxane that allowed no 129Xe interaction with the CB6 macrocycle component until a cleavage event released the CB6, which then produced a 129Xe@CB6 NMR signal. This contrast-upon-activation 129Xe NMR platform allows for modular synthesis and can be expanded to applications in detection and disease imaging. Abstract: The power conversion efficiency of organic solar cells (OSCs) could benefit from systematic studies to improve bulk heterojunction (BHJ) morphology by modifying donor compounds. Supramolecular self-assembly is an attractive strategy to combine the beneficial properties of polymeric donors, such as a well-controlled morphology, with the homogeneous composition of small molecule donors for OSCs. We report here on two tripodal “star-shaped” small-molecule donor compounds based on diketopyrrolopyrrole (DPP) side chains for solution-processed BHJ OSCs. The tripod molecules were found not to aggregate in solution or form crystalline domains in thin films when a branched alkyl chain (2-ethylhexyl) substituent was used, whereas linear (docedecyl) alkyl chains promote the formation of one-dimensional (1D) nanowires and more crystalline domains in the solid state. We demonstrate that the 1D self-assembly of these tripods enhances the performance of the corresponding solution-processed OSCs by 50%, which is attributed to the significant increase in the fill factor of devices resulting from a reduction of trap states. Abstract: Tunable solid-state fluorescent materials are ideal for applications in security printing technologies. A document possesses a high level of security if its encrypted information can be authenticated without being decoded, while also being resistant to counterfeiting. Herein, we describe a heterorotaxane with tunable solid-state fluorescent emissions enabled through reversible manipulation of its aggregation by supramolecular encapsulation. The dynamic nature of this fluorescent material is based on a complex set of equilibria, whose fluorescence output depends non-linearly on the chemical inputs and the composition of the paper. By applying this system in fluorescent security inks, the information encoded in polychromic images can be protected in such a way that it is close to impossible to reverse engineer, as well as being easy to verify. This system constitutes a unique application of responsive complex equilibria in the form of a cryptographic algorithm that protects valuable information printed using tunable solid-state fluorescent materials. Abstract: “Molecular flasks” are well-defined supramolecular cages that can encapsulate one or more molecular guests within their cavities and, in so doing, change the physical properties and reactivities of the guests. Although molecular flasks are powerful tools for manipulating matter on the nanoscale, most of them are limited in their scope because of size restrictions. Recently, however, increasingly large and diverse supramolecular cages have become available with enough space in their cavities for larger chemical systems such as polymers, nanoparticles, and biomolecules. Here we report how a class of metallosupramolecular cages known as M12L24polyhedra have been adapted to serve as nanometer-scale containers for solutions of a pseudorotaxane host–guest complex based on a tetracationic cyclophane host, cyclobis(paraquat-p-phenylene) (CBPQT4+), and a 1,5-dioxynaphthalene (DNP) guest. Remarkably, the hierarchical integration of pseudorotaxanes and M12L24 superhosts causes the system to express stimulus-responsive behavior, a property which can be described as emergent because neither the DNP⊂CBPQT4+ nor the M12L24 assemblies exhibit this behavior independently. The DNP-containing M12L24 molecular flasks are effectively “sealed off” to CBPQT4+ until ions are added as a stimulus to “open” them. The electrolyte stimulus reduces the electrostatic screening distance in solution, allowing favorable DNP⊂CBPQT4+ host–guest interactions to overcome repulsive Coulombic interactions between the cationic M12L24 cages and CBPQT4+ rings. This unusual example of ion-gated transport into chemical nanocontainers is reminiscent of transmembrane ion channels which act as gates to the cell, with the important difference that this system is reversible and operates at equilibrium. Conspectus: More than two decades of investigating the chemistry of bistable mechanically interlocked molecules (MIMs), such as rotaxanes and catenanes, has led to the advent of numerous molecular switches that express controlled translational or circumrotational movement on the nanoscale. Directed motion at this scale is an essential feature of many biomolecular assemblies known as molecular machines, which carry out essential life-sustaining functions of the cell. It follows that the use of bistable MIMs as artificial molecular machines (AMMs) has been long anticipated. This objective is rarely achieved, however, because of challenges associated with coupling the directed motions of mechanical switches with other systems on which they can perform work. A natural source of inspiration for designing AMMs is muscle tissue, since it is a material that relies on the hierarchical organization of molecular machines (myosin) and filaments (actin) to produce the force and motion that underpin locomotion, circulation, digestion, and many other essential life processes in humans and other animals. Muscle is characterized at both microscopic and macroscopic length scales by its ability to generate forces that vary the distance between two points at the expense of chemical energy. Artificial muscles that mimic this ability are highly sought for applications involving the transduction of mechanical energy. Rotaxane-based molecular switches are excellent candidates for artificial muscles because their architectures intrinsically possess movable filamentous molecular components. In this Account, we describe (i) the different types of rotaxane “molecular muscle” architectures that express contractile and extensile motion, (ii) the molecular recognition motifs and corresponding stimuli that have been used to actuate them, and (iii) the progress made on integrating and scaling up these motions for potential applications. We identify three types of rotaxane muscles, namely, “daisy chain”, “press”, and “cage” rotaxanes, and discuss their mechanical actuation driven by ions, pH, light, solvents, and redox stimuli. 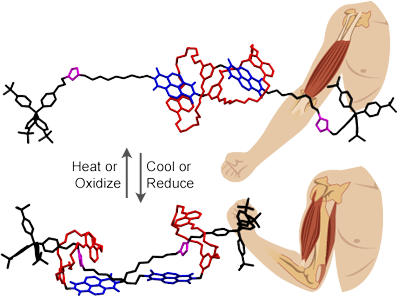 Different applications of these rotaxane-based molecular muscles are possible at various length scales. On a molecular level, they have been harnessed to create adjustable receptors and to control electronic communication between chemical species. On the mesoscale, they have been incorporated into artificial muscle materials that amplify their concerted motions and forces, making future applications at macroscopic length scales look feasible. We emphasize how rotaxanes constitute a remarkably versatile platform for directing force and motion, owing to the wide range of stimuli that can be used to actuate them and their diverse modes of mechanical switching as dictated by the stereochemistry of their mechanical bonds, that is, their mechanostereochemistry. We hope that this Account will serve as an exposition that sets the stage for new applications and materials that exploit the capabilities of rotaxanes to transduce mechanical energy and help in paving the path going forward to genuine AMMs. Abstract:We report the one-pot synthesis and electrochemical switching mechanism of a family of electrochemically bistable ‘daisy chain’ rotaxane switches based on a derivative of the so-called ‘blue box’ (BB4+) tetracationic cyclophane cyclobis(paraquat-p-phenylene). These mechanically interlocked molecules are prepared by stoppering kinetically the solution-state assemblies of a self-complementary monomer comprising a BB4+ ring appended with viologen (V2+) and 1,5-dioxynaphthalene (DNP) recognition units using click chemistry. Six daisy chains are isolated from a single reaction: two monomers (which are not formally ‘chains’), two dimers, and two trimers, each pair of which contains a cyclic and an acyclic isomer. The products have been characterized in detail by high-field 1H NMR spectroscopy in CD3CN—made possible in large part by the high symmetry of the novel BB4+ functionality—and the energies associated with certain aspects of their dynamics in solution are quantified. Cyclic voltammetry and spectroelectrochemistry have been used to elucidate the electrochemical switching mechanism of the major cyclic daisy chain products, which relies on spin-pairing interactions between V•+ and BB2(•+) radical cations under reductive conditions. These daisy chains are of particular interest as electrochemically addressable molecular switches because, in contrast with more conventional bistable catenanes and rotaxanes, the mechanical movement of the ring between recognition units is accompanied by significant changes in molecular dimensions. Whereas the self-complexed cyclic monomer—known as a [c1]daisy chain or molecular ‘ouroboros’—conveys sphincter-like constriction and dilation of its ultramacrocyclic cavity, the cyclic dimer ([c2]daisy chain) expresses muscle-like contraction and expansion along its molecular length. Abstract: Although motor proteins are essential cellular components that carry out biological processes by converting chemical energy into mechanical motion, their functions have been difficult to mimic in artificial synthetic systems. Daisy chains are a class of rotaxanes which have been targeted to serve as artificial molecular machines because their mechanically interlocked architectures enable them to contract and expand linearly, in a manner that is reminiscent of the sarcomeres of muscle tissue. The scope of external stimuli that can be used to control the muscle-like motions of daisy chains remains limited, however, because of the narrow range of supramolecular motifs that have been utilized in their templated synthesis. Reported herein is a cyclic daisy chain dimer based on π-associated donor–acceptor interactions, which can be actuated with either thermal or electrochemical stimuli. Molecular dynamics simulations have shown the daisy chain’s mechanism of extension/contraction in the ground state in atomistic detail. Abstract: Previous work has shown that nanoscale lamellar inorganic–organic hybrid materials can be synthesized on transparent conductive substrates via the electrodeposition of Zn(OH)2 in the presence of conjugated surfactants. These surfactants introduce p-type semiconducting supramolecular phases; thus, following conversion of the Zn(OH)2 phase to the n-type semiconductor ZnO, the lamellar hybrids exhibit high photoconductive gains and can exhibit photovoltaic activity. We report here on a family of carboxylated terthiophene-based surfactants designed with systematic modifications to molecular geometry, valency, and flexibility to investigate how these features affect the synthesis of the p-type/n-type semiconducting hybrid materials. We use scanning electron microscopy (SEM) and two-dimensional (2D) grazing-incidence X-ray diffraction (2D-GIXD) to correlate molecular features of the surfactants with growth and orientation of the nanoscale lamellae that form during electrodeposition on either hydrophilic or hydrophobic substrates. We find that molecularly flexible, monovalent terthiophene amphiphiles with linear geometries generate highly oriented and homogeneous films of the nanoscale hybrids, whereas T-shaped geometries, rigid molecules, or divalent surfactants tend to produce more heterogeneous and isotropically oriented lamellae under the same conditions. The critical aggregation concentrations (CAC) of the amphiphiles are higher than the concentrations used during electrodeposition, indicating that the growth and orientation of lamellar structures are mediated by surfactant–substrate interactions, rather than the assemblies they form in bulk solutions. Molecular design in these hybrid systems is a key factor in optimizing function, since dense and macroscopically oriented growth is necessary in both photoconductivity and photovoltaic efficiency of solar cells. Conspectus: The ability to design and confer control over the kinetics of theprocesses involved in the mechanisms of artificial molecular machines is at the heart of the challenge to create ones that can carry out useful work on their environment, just as Nature is wont to do. As one of the more promising forerunners of prototypical artificial molecular machines, chemists have developed bistable redox-active donor–acceptor mechanically interlocked molecules (MIMs) over the past couple of decades. These bistable MIMs generally come in the form of rotaxanes, molecular compounds that constitute a ring mechanically interlocked around a dumbbell-shaped component, or catenanes, which are composed of two mechanically interlocked rings. As a result of their interlocked nature, bistable MIMs possess the inherent propensity to express controllable intramolecular, large-amplitude, and reversible motions in response to redox stimuli. In this Account, we rationalize the kinetic behavior in the ground state for a large assortment of these types of bistable MIMs, including both rotaxanes and catenanes. These structures have proven useful in a variety of applications ranging from drug delivery to molecular electronic devices. These bistable donor–acceptor MIMs can switch between two different isomeric states. The favored isomer, known as the ground-state co-conformation (GSCC) is in equilibrium with the less favored metastable state co-conformation (MSCC). The forward (kf) and backward (kb) rate constants associated with this ground-state equilibrium are intimately connected to each other through the ground-state distribution constant, KGS. Knowing the rate constants that govern the kinetics and bring about the equilibration between the MSCC and GSCC, allows researchers to understand the operation of these bistable MIMs in a device setting and apply them toward the construction of artificial molecular machines. The three biggest influences on the ground-state rate constants arise from (i) ground-state effects, the energy required to breakup the noncovalent bonding interactions that stabilize either the GSCC or MSCC, (ii) spacer effects, where the structures overcome additional barriers, either steric or electrostatic or both, en route from one co-conformation to the other, and (iii) the physical environment of the bistable MIMs. By managing all three of these effects, chemists can vary these rate constants over many orders of magnitude. We also discuss progress toward achieving mechanostereoselective motion, a key principle in the design and realization of artificial molecular machines capable of doing work at the molecular level, by the strategic implementation of free energy barriers to intramolecular motion. Abstract: Organic photovoltaic device efficiencies can be greatly improved by controlling the morphology of donor and acceptor domains in the active layer. Connectivity within donor and acceptor domains is of key importance in order to direct charge carriers efficiently to the electrodes. We report here on self-assembly pathways leading towards optimal morphology of solar cell active layers, using as the donor a hairpin-shaped molecule containing a trans-1,2-diamidocyclohexane core and two arms of diketopyrrolopyrrole conjugated segments, and a C71 fullerene derivative as the electron acceptor. Self-assembly of the donor molecule is driven by the synergistic action of hydrogen bonds and π–π stacking, and under proper conditions this results in the formation of long supramolecular nanowires that enhance charge transport and device efficiencies. We found that a stepwise cooling process with minimal stirring of solutions is necessary to create by self-assembly robust wires that are not disrupted when acceptor molecules are added. The efficiencies of devices created by this process can be 400-fold greater than those of devices formed by simple mixing of donor and acceptor molecules. The synergistic action of hydrogen bonds and π stacking in donor molecules that create long nanowires by self-assembly results in devices that are 54% more efficient than those built with analogous donor molecules containing only the conjugated structure. Abstract: Using impedance spectroscopy, we demonstrate that the low fill factor (FF) typically observed in small molecule solar cells is due to hindered carrier transport through the active layer and hindered charge transfer through the anode interfacial layer (IFL). By carefully tuning the active layer thickness and anode IFL in BDT(TDPP)2solar cells, the FF is increased from 33 to 55% and the PCE from 1.9 to 3.8%. These results underscore the importance of simultaneously optimizing active layer thickness and IFL in small molecule solar cells. 13. Juriček, M.; Barnes, J. C.; Dale, E. J.; Liu, W.-G.; Strutt, N. L.; Bruns, C. J.; Vermeulen, N. A.; Ghooray, K.; Sarjeant, A. A.; Stern, C. L.; Botros, Y. Y.; Goddard, W. A. III; Stoddart, J. F. Ex2Box: Interdependent Modes of Binding in a Two-Nanometer-Long Synthetic Receptor. J. Am. Chem. Soc. 2013, 135, 12736–12746. Abstract: Incorporation of two biphenylene-bridged 4,4′-bipyridinium extended viologen units into a para-phenylene-based cyclophane results in a synthetic receptor that is ∼2 nm long and adopts a box-like geometry. This cyclophane, Ex2Box4+, possesses the ability to form binary and ternary complexes with a myriad of guest molecules ranging from long π-electron-rich polycyclic aromatic hydrocarbons, such as tetracene, tetraphene, and chrysene, to π-electron-poor 2,6-dinitrotoluene, 1,2,4-trichlorobenzene, and both the 9,10- and 1,4-anthraquinone molecules. Moreover, Ex2Box4+is capable of forming one-to-one complexes with polyether macrocycles that consist of two π-electron-rich dioxynaphthalene units, namely, 1,5-dinaphthocrown-10. This type of broad molecular recognition is possible because the electronic constitution of Ex2Box4+ is such that the pyridinium rings located at the “ends” of the cyclophane are electron-poor and prefer to enter into donor–acceptor interactions with π-electron-rich guests, while the “middle” of the cyclophane, consisting of the biphenylene spacer, is more electron-rich and can interact with π-electron-poor guests. In some cases, these different modes of binding can act in concert to generate one-to-one complexes which possess high stability constants in organic media. The binding affinity ofEx2Box4+ was investigated in the solid state by way of single-crystal X-ray diffraction and in solution by using UV–vis and NMR spectroscopy for 12 inclusion complexes consisting of the tetracationic cyclophane and the corresponding guests of different sizes, shapes, and electronic compositions. Additionally, density functional theory was carried out to elucidate the relative energetic differences between the different modes of binding of Ex2Box4+ with anthracene, 9,10-anthraquinone, and 1,4-anthraquinone in order to understand the degree with which each mode of binding contributes to the overall encapsulation of each guest. Abstract: A supramolecular polymer made of thousands of bistable [c2]daisy chains amplifies individual nanometric displacements up to the micrometre-length scale, in a concerted process reminiscent of muscular cells. Abstract: We describe in detail a strategy for creating foldamers in which interactions between mechanically interlocked components dictate the single-molecule assembly of a folded secondary structure. This unique folding motif is based on a flexible polyether dumbbell bearing 1,5-dioxynaphthalene (DNP) donors, which folds its way through a series of cyclobis(paraquat-p-phenylene) (CBPQT4+) acceptor rings in a serpentine fashion to enable extended donor–acceptor (D–A) stacking between DNP and the electron-poor 4,4′-bipyridinium (BIPY2+) units in CBPQT4+. These oligorotaxanes can be prepared in a wide range of sizes, with molecular weights up to >15000 Da, on account of novel one-pot reactions we developed to generate the necessary oligo-DNP precursors. The product distributions from the final kinetically controlled stoppering reactions are highly biased towards oligorotaxanes in which approximately half of the DNP units are encircled by rings, a fact which can be rationalized if the dominant solution-state structures of thepseudorotaxane precursors reflect the solid-state superstructures of analogous compounds, which express 50% recognition site occupancy because of their proclivity to pack into continuous D–A–D–A stacks. The presence of well-defined folded structures in solution have been confirmed by 1H NMR spectroscopy in CD3CN. Moreover, we discovered an empirical selection rule forbidding CBPQT4+ rings to occupy adjacent DNP sites, which elegantly explains both the product distributions and the 1H NMR spectra. Depending on their adherence to this selection rule, all of the oligorotaxanes belong to one of three families: whereas ‘Confused’ oligorotaxanes adopt multiple translational isomers that satisfy the rule and ‘Frustrated’ species cannot obey it at all, members of the ‘Happy’ family each express only one rule-compliant ‘Goldilocks’ isomer. TheNMR spectra of these oligorotaxanes also shed light on their dynamics; rapid 180° rotations of DNP units cause pairs of heterotopic BIPY2+ protons in the accompanying CBPQT4+ rings to exchange sites, giving rise to time-averaged signals. This process, which we term ‘superrotation’, will apply much more generally to other mechanically interlocked systems. 10. Barnes, J. C.; Juriček, M.; Strutt, N. L.; Frasconi, M.; Sampath, S.; Giesener, M. A.; McGrier, P. L.; Bruns, C. J.; Stern, C. L.; Sarjeant, A. A.; Stoddart, J. F. ExBox: A Polycyclic Aromatic Hydrocarbon Scavenger. J. Am. Chem. Soc. 2013, 135, 183–192. Abstract: A template-directed protocol, which capitalizes on donor–acceptor interactions, is employed to synthesize a semi-rigid cyclophane (ExBox4+) that adopts a box-like geometry and is comprised of π-electron-poor 1,4-phenylene-bridged (“extended”) bipyridinium units (ExBIPY2+). ExBox4+functions as a high-affinity scavenger of an array of different polycyclic aromatic hydrocarbons (PAHs), ranging from two to seven fused rings, as a result of its large, accommodating cavity (approximately 3.5 Å in width and 11.2 Å in length when considering the van der Waals radii) and its ability to form strong non-covalent bonding interactions with π-electron-rich PAHs in either organic or aqueous media. In all, 11 PAH guests were observed to form inclusion complexes with ExBox4+, with coronene being the largest included guest. 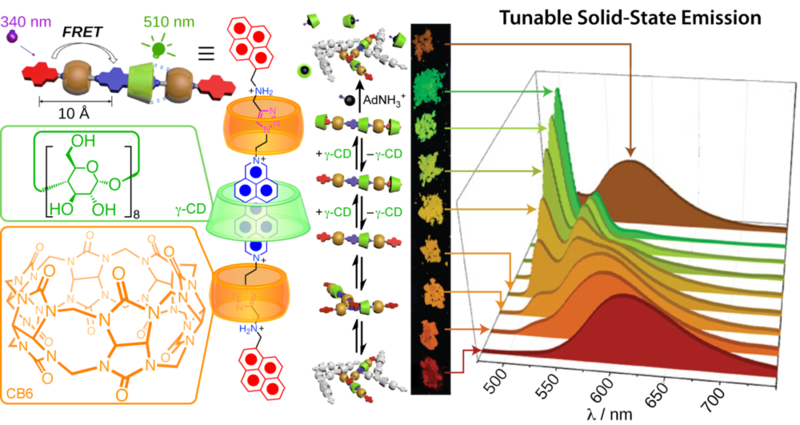 Single-crystal X-ray diffraction data for the 11 inclusion complexes ExBox4+⊂PAH as well as UV/vis spectroscopic data for 10 of the complexes provide evidence of the promiscuity of ExBox4+ for the various PAHs. Nuclear magnetic resonance spectroscopy and isothermal titration calorimetric analyses of 10 of the inclusion complexes are employed to further characterize the host–guest interactions in solution and determine the degree with which ExBox4+ binds each PAH compound. As a proof-of-concept, a batch of crude oil from Saudi Arabia was subjected to extraction with the water-soluble form of the PAH receptor, ExBox·4Cl, resulting in the isolation of different aromatic compounds after ExBox·4Cl was regenerated. 9. Bruns, C. J.; Gothard, C. M.; Gothard, N. A.; Grzybowski, B. A.; Stoddart, J. F. Modular Synthesis of Bipyridinium Oligomers and Corresponding Donor-Acceptor Oligorotaxanes with Crown Ethers. Org. Lett. 2012, 14, 5066–5069. Abstract: Donor–acceptor - and rotaxanes have been prepared from bipyridinium (BIPY2+) oligomers and 1,5-dinaphthocrown-10 (DN38C10) by a threading-followed-by-stoppering protocol employing click chemistry. An efficient, straightforward route to the BIPY2+ oligomers has been developed that requires little to no chromatographic purification. Unlike most donor–acceptor oligorotaxanes that have been reported to date, 100% of the recognition sites on the dumbbells are occupied by rings. Abstract: A neutral donor–acceptor rotaxane, which has been synthesized using click chemistry, has had its solid-state structure and superstructure elucidated by X-ray crystallography. Both dynamic 1H NMR spectroscopy and electrochemical investigations have been employed in an attempt to shed light on both geometrical reorganization and redox-switching processes that are occurring or can be induced within the rotaxane. Abstract: Charged donor–acceptor catenanes containing cyclobis(paraquat-p-phenylene) as the ring component can be synthesised in yields of up to 88% in under one hour by heating two precursors in the presence of macrocyclic polyether templates in N,N-dimethylformamide at 80 °C. Conspectus: Fashioned through billions of years of evolution, biological molecular machines, such as ATP synthase, myosin, and kinesin, use the intricate relative motions of their components to drive some of life’s most essential processes. Having control over the motions in molecules is imperative for life to function, and many chemists have designed, synthesized, and investi- gated artificial molecular systems that also express controllable motions within molecules. Using bistable mechanically inter- locked molecules (MIMs), based on donoracceptor recognitionmotifs, we have sought to imitate the sophisticated nanoscale machines present in living systems. In this Account, we analyze the thermodynamic characteristics of a series of redox-switchable rotaxanes and catenanes. Control and understanding of the relative intramolecular movements of components in MIMs have been vital in the development of a variety of applications of these compounds ranging from molecular electronic devices to drug delivery systems. These bistable donoracceptor MIMs undergo redox-activated switching between two isomeric states. Under ambient conditions, the dominant translational isomer, the ground-state coconformation (GSCC), is in equilibrium with the less favored translational isomer, the metastable-state coconformation (MSCC). By manipulating the redox state of the recognition site associated with the GSCC, we can stimulate the relative movements of the components in these bistable MIMs. The thermodynamic parameters of model hostguest complexes provide a good starting point to rationalize the ratio of GSCC to MSCC at equilibrium. The bistable rotaxanes show a strong correlation between the relative free energies of model complexes and the ground-state distribution constants (KGS). This relationship does not always hold for bistable catenanes, most likely because of the additional steric and electronic constraints present when the two rings are mechanically interlocked with each other. Measuring the ground-state distribution constants of bistable MIMs presents its own set of challenges. While it is possible, in principle, to determine these constants using NMR and UVvis spectroscopies, these methods lack the sensitivity to permit the determination of ratios of translational isomers greater than 10:1 with sufficient accuracy and precision. A simple application of the Nernst equation, in combination with variable scan-rate cyclic voltammetry, however, allows the direct measurement of ground-state distribution constants across a wide range (KGS = 10104) of values. Abstract: We report the synthesis, characterization, and first implementation of a naphtho[2,3-b:6,7-b′]dithiophene (NDT)-based donor molecule in highly efficient organic photovoltaics (OPVs). When NDT(TDPP)2 (TDPP = thiophene-capped diketopyrrolopyrrole) is combined with the electron acceptor PC61BM, a power conversion efficiency (PCE) of 4.06 ± 0.06% is achieved—a record for a PC61BM-based small-molecule OPV. The substantial PCE is attributed to the broad, high oscillator strength visible absorption, the ordered molecular packing, and an exceptional hole mobility of NDT(TDPP)2. Abstract: We have devised a method of achieving the much-used macrocyclic polyether, 1,5-dinaphthocrown-10, in three steps by a route that is more efficient and requires fewer purification procedures than those reported in the literature to date. The strategy can also be extended to the synthesis of asymmetric crown-10 ether derivatives with one 1,5-dinaphtho ring system. Abstract: A strategic modification to the corner ligands in PdII-containing, electron-poor cyclophanes has profound repercussions for their assemblies with electron-rich aromatic crown ethers in both the solid and solution states; the formation of ring-in-ring complexes can override competingcatenane production on masking the hydrogen bond donor capabilities of the corner ligands. Abstract: The synthesis of azalamellarins, a new series of lactam analogues of biologically activelamellarins, was achieved using CuI-mediated and microwave-assisted CNamide bond formation. Seventeen azalamellarins, including N-allylazalamellarins and N-propylazalamellarins χ-D, L-N, and J-dehydro J, were synthesized and evaluated for their cytotoxicity against the cancer cell lines HuCCA-1, A-549, HepG2, and MOLT-3. The results showed that certain azalamellarins exhibited good activities in the micromolar IC50 value range (IC50=the drug concentration that causes 50 % of cell-growth inhibition after 72 h of continuous exposure to the test molecule), comparable to their parent lamellarin analogue. – Artificial molecular switches and machines based on the large-amplitude translational and rotational motions expressed by suitably designed catenanes and rotaxanes. This contemporary and highly interdisciplinary field is summarized in a visually appealing, image-driven format, with more than 800 illustrations covering both fundamental and applied research. The Nature of the Mechanical Bond is a must-read for everyone, from students to experienced researchers, with an interest in chemistry’s latest and most non-canonical bond.